24. References: Hall's Geology of Iowa. Vol. I., part II. 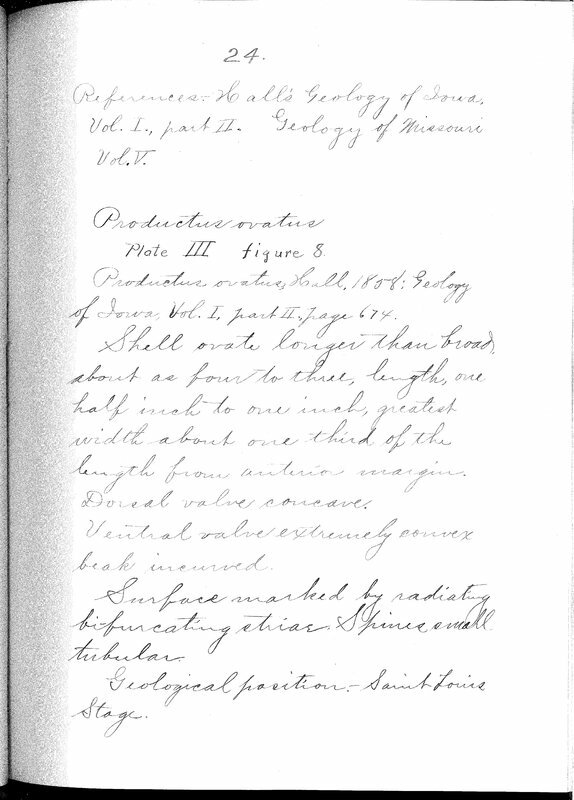 Geology of Missouri Vol.V. Productus ovatus Plate III figure 8. Productus ovatus, Hall, 1858: Geology of Iowa. Vol. I. part II., page 674. Shell ovate longer than broad, about as four to three, length, one half inch to one inch, greatest width about one third of the length from anterior margin. Dorsal valve concave. Ventral valve extremely convex beak incurved. Surface marked by bifurcating striae. Spines small tubular. Geological position: Saint Louis Stage.